Alienation is funny. The gap between workers and the products of their labor--that gap Marx called alienation--has inspired laughter from Dickens to Chaplin to Alladeen, the multi-media theater piece now at the Brooklyn Academy of Music. The spectacle of labor that distances workers from a humane life can be hilarious. A sentence in Henri Lefebvre's Critique of Everyday Life can stand as a test for representations of alienating work: "An art based on alienation must struggle against alienation; if not it sanctions it." The crucial example for Lefebvre is, unsurprisingly, Brecht, whose so-called "alienation effect" had the aim of distancing--alienating--the spectator from the alienation Brecht's plays represented. That we Anglophones use the word "alienation" to describe both the poison and the cure has made for many hours of confusion in classrooms and beyond. The simple, Brechtian point would be that theater should put distance between the viewer and the social world. That alienating distance should, in turn, make social alienation seem strange once again, and such awareness should lead to change. Brecht's critical hope for theater invites generalizations about different media. Why not indulge? One of television's main functions is to make people forget the suffering their own work entails; that is, it sanctions alienation. One of the main tasks of theater since the late nineteenth century, on the other hand, has been to struggle against such alienation. We recognize this by continuing to read Hauptmann's The Weavers as one of the first "modern" plays. Alladeen pulls this modern theme into the age of satellite telephony and the Internet, though it involves a gamble. 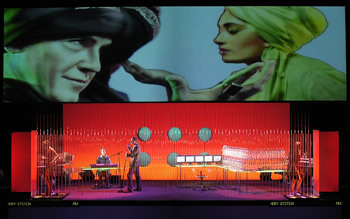 In Lefebvre's terms, Alladeen bets that spectacular multi-media resources can form part of an alienating theater piece that will not sanction the alienation it represents. Alladeen, at once visually alluring and aurally provocative, is a collaboration directed by Marianne Weems and conceived by Weems, of the New York-based Builders Association, with Keith Khan and Ali Zadi, of the London-based motiroti. The production also draws on the talents of a wide array of performers, sound and video designers, 3D animation designers, CD artwork licensers, and pop musicians. The centerpiece is a call center in Bangalore, with the action focusing on the experiences of two women and two men as they move from training to work in telemarketing. Since their customers are from the U.S., their training involves a process of quite explicit alienation. They must become simulacral Americans, learning American speech, getting a crash course in American culture, becoming, in short, so far as their customers are concerned, Americans. In a video screened on a scrim above the stage, SharuJose, a trainer, chillingly describes the aim of the training: the workers at the call center will attain an American speech without any "mother tongue influence." (Portions of this interview are part of a related web site, www.alladeen.com.) The struggles against "mother tongue influence" produce Alladeen's comedy. As the workers learn to speak to customers "they will never ever see," American place names (Olympia, Washington), American pastimes (football), and American television (Friends) become the hazards they must negotiate during their night-owl's work, which begins at 3 a.m. and ends at noon. No amount of training in "clichés and idioms" can prepare them for the stoner who wants to get from "Philly" to Boston, or the home-boy who speaks of putting the "bling bling" on his girlfriend's finger. (She's a princess, he says. Well then, responds the call center employee, get your family together with her family and arrange a good dowry. Where's the problem? End of call.) The imitation of Friends provides some of the production's most amusing uses of electronic media. We see the workers' faces on screens above them, and their faces erratically morph into the faces of the television characters whose names they have borrowed: Joey, Phoebe, Rachel. In the realm of the image, they achieve the identities for which they have trained. Most of the featured characters do fairly well despite crossed wires. One woman helps a man lost in mountains and darkness somewhere near Yosemite. Another shows a real knack for sales. At the end of the opening Bangalore segment, it becomes clear that one woman will be fired. The successful salesman, meanwhile, has emerged as the production's Aladdin. Such is his tremendous good fortune that he discovers a magical lamp from which a genie emerges, offering him all he might desire . . . Yes, I exaggerate. His American overseer, however, does promise him a trip to California to take part in a conference. Scenes in New York and London frame the central section of Alladeen. These scenes feature a polyglot woman with a cell phone in New York who makes a date to meet her boyfriend in Las Vegas. While on the phone in London, she makes another date to meet other friends for an evening of karaoke. By chance our Aladdin, the Bangalore salesman, who has moved up the ranks at his telemarketing company, is at the karaoke bar. The elegant polyglot sniffs at his line of work. Yet apparently the operators themselves, while well aware of the incongruities of their jobs, did not feel exploited. They were young, well paid by local standards and believed they were acquiring skills that made it worth working through Indian nights in order to serve daytime America. "Everyone we met was Aladdin," Mr. Khan said. "They had a deep belief that they could get what they wanted--go to America and marry a princess." The fable also permeates Alladeen: Here are Indians wishing to change their lives, as Aladdin does. Here are Americans touching buttons and summoning up genies to provide goods and services. 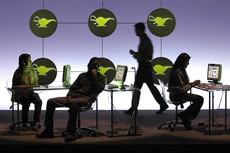 At one point, the video screens in Alladeen broadcast images of call center employees describing their wishes. Many confirm the good spirits Nightingale describes; one bearded man speaks with special jollity of his wish to go to Scotland. Another rather worn-down man, however, gives the lie to Nightingale's Panglossian account. He radiates weariness as he expresses his wish to work from nine to six, like everyone else. The frugality of this wish reveals the erasure of everyday social life that the work at the call center requires. There is, then, a kind of division in Alladeen between its comic and alienating representations of the call center and the Aladdin story from the 1001 Nights. At times it seems as though the theater makers have become the genies, asking people what their wishes are, and then giving them what they desire: a "rags to riches" story, to steal a cliché from the Alladeen web site. The Aladdin story is, as Khan suggests, a way of imaginatively fulfilling the desire of the workers in Bangalore. But those workers are not the audience of the theater piece, which is scheduled to travel to Turkey, Colombia, and Singapore, but has not yet been to India. Would Alladeen on a stage in Bangalore confirm fantasies of upward and outward mobility? Or would the ironies of the Aladdin plot be all too evident? With Lefebvre in mind, it seems to me crucial to challenge the logic of Nightingale's account. One way to sanction alienation is to decide that it exists only where workers declare that they "feel exploited." (As I have suggested, one does not need to venture far into the textures of Alladeen to hear such protests in any case.) If American audiences begin to forget that those in Bangalore's call centers are not genies--or that the whole notion that they might be genies is a grotesque metaphor--then Alladeen will certainly have betrayed the intentions of its creators. For some viewers--perhaps for many in the Brooklyn audience--Alladeen might occasion a sort of swerving between the poles of Brecht's Verfremdungseffekt, described by Lefebvre as "an externalized judgement" and "an immersion in the image proposed." For many others, however, the piece may occasion a hi-tech forgetting, an alienation through fascination and a loss of "externalized judgement" in "immersion in the image." Global souls . . . belong to a kind of migratory tribe, able to see things more clearly than those imprisoned in local concerns can, yet losing their identity often as they fall between the cracks. A Global Soul is a ventriloquist, an impersonator, or an undercover agent . . . The chic London karaoke bar and the Bangalore call center are both sites of ventriloquism and impersonation. Now salesman Aladdin mans the phones. Now he sings over a backing track in Piccadilly. His progress satisfies a wish. Does Alladeen give us enough to examine this satisfying plot dialectically? Or does its fascinating technology blur the difference between the polyglot's world of choices and the enforced loss of identity at the call center?